Quickly restore wood furniture with Howard’s Restor-A-Finish. 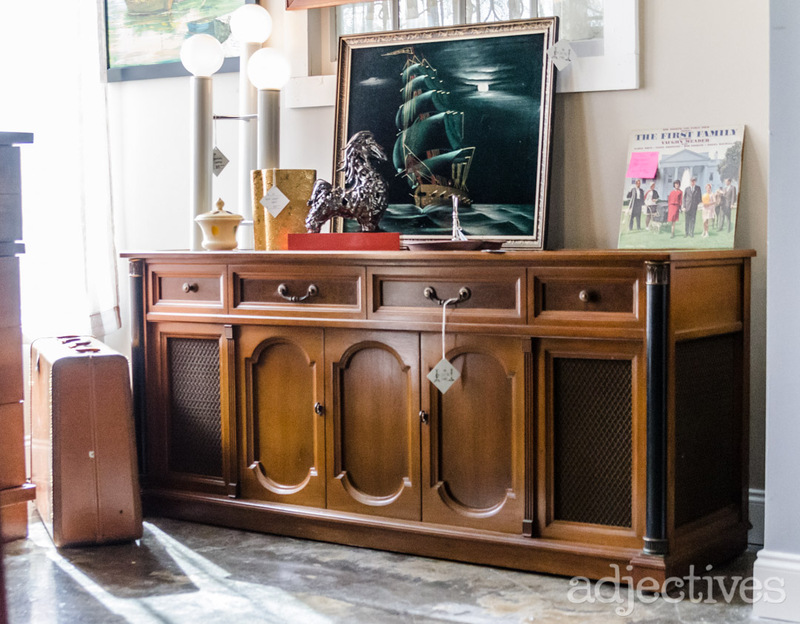 Don’t you love going on the hunt for vintage and antique furniture? There is something so satisfying about finding a piece of wood furniture that you can restore and make your own. 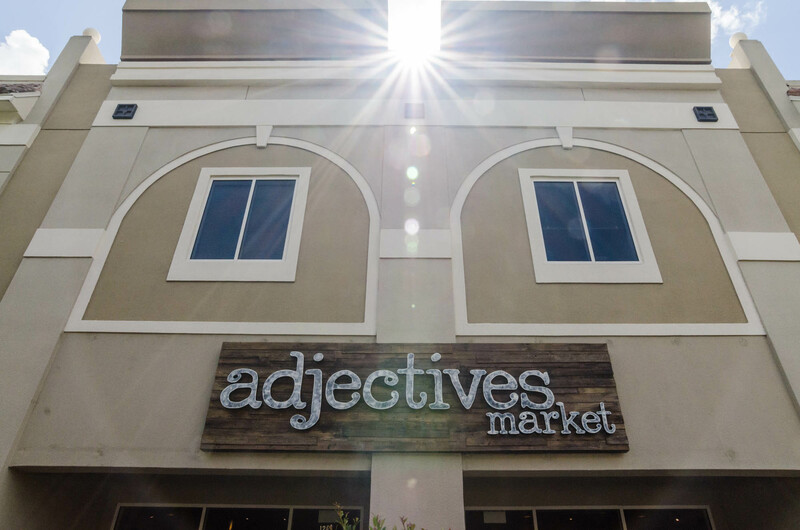 We do it all the time here at Adjectives! There’s one major catch to buying pre-owned furniture. Inevitably, when you find an old piece, you have to deal with the wear-and-tear of the life it lived before. There’s always some reason to restore wood furniture whether its vintage, antique or even new! Is it worth the price to fix this? Can I fix it easily or will it be a whole weekend project? In short, we’ve got you covered with the perfect solution for your soon-to-be “new” piece. To quickly restore wood furniture, look no further than Howard’s Restor-A-Finish. 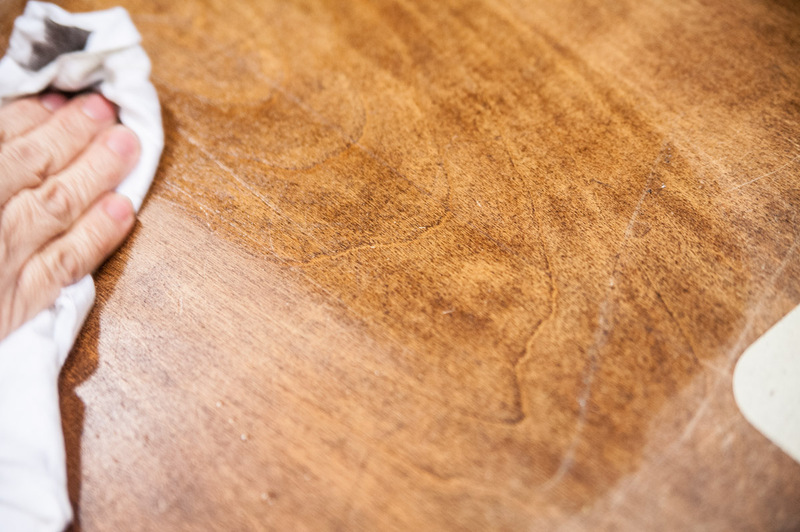 With simply a lint-free rag and this magical wood care product, you can restore wood furniture with just a few swipes! It will not remove or soften the existing finish this is why it is very popular to use on antiques. Howard’s Restor-A-Fishing preserves the original wood finish as well as helps preserve its authenticity and value. If you strip the finish, it may also strip the wood furniture of its value. 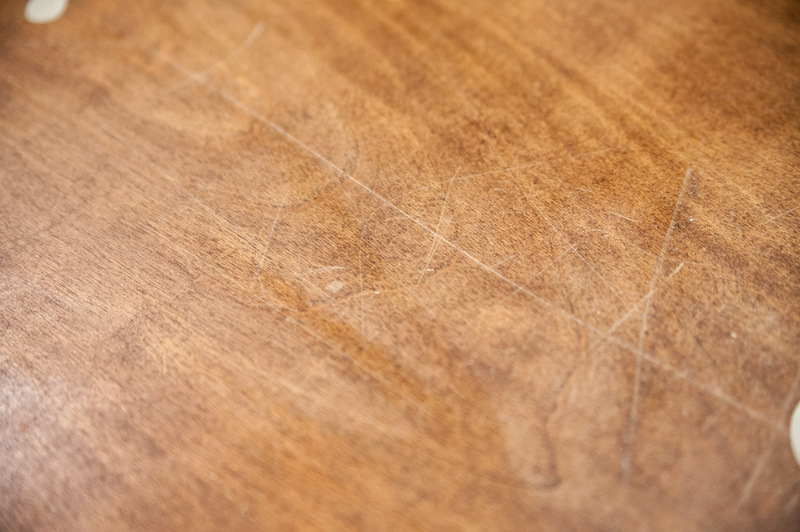 When you want to keep the value of a piece, it’s always best to restore wood furniture, keeping as much of the original wood finish as possible. Restor-A-Finish maintains the original “patina” or finish so it helps keeps the wood furniture’s character. That’s why for over 40 years, Howard’s Restor-A-Finish has been a staple in the antique industry. Restor-A-Finish was created in a garage. 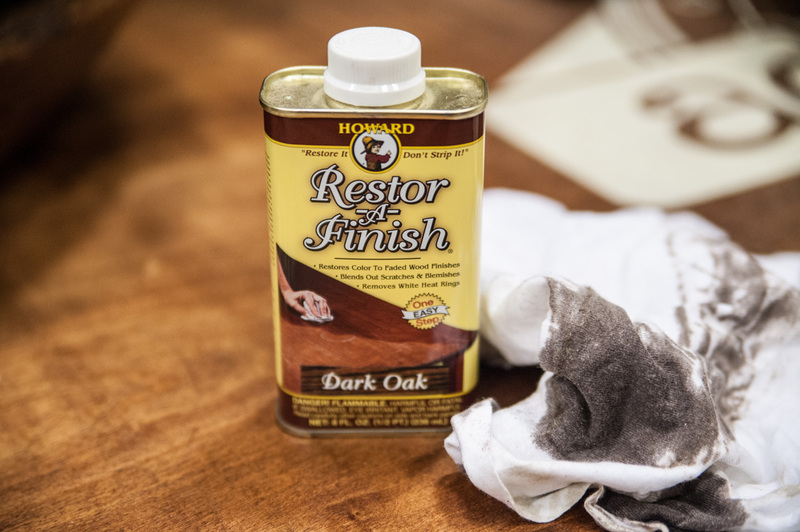 Originally designed by Douglas G. Howard in 1969, this wood finishing product is incredibly easy to use and takes no time at all to restore wood furniture! Mr. Howard set out to solve the dilemma of eliminating blemishes in wood finishes without removing the existing finish. Since the answer was not at his local hardware store, he went to work in his garage to create his own. His goal was to make something that would be much more than a surface treatment. Yet he wanted nothing like a stripper or a refinisher. The idea was to develop a formula that could penetrate the finish with stain and leave the original finish. The end result was Restor-A-Finish. Essentially, Restor-A-Finish enhances your wood finish to do away with visible blemishes such as minor scratches, heat marks, watermarks, you name it. Restor-A-Finish was Doug Howard’s first in what would become a complete line of wood care products. Since their beginning, Howard Products has continuously come out with innovative new products to enhance their existing product line. What makes this wood care product stand out from its competitors is its simplicity of use and how well it performs long term. Plus it comes in just about every major shade of wood finish out there so you are sure to find a color to match the piece of furniture you are working on. Let’s take this large wood table top for instance. This is an older piece that is located in a high-traffic area so, over the years, it’s received plenty of scratches and blemishes. You can see the scratches, they seem very permanent and almost impossible to remove. But with one swipe of a lint-free rag doused with Howard’s Restor-A-Finish, the scratches almost completely disappear! Notice how it immediately alleviates the scratches and brings its luxurious finish back to life. The unique formula inside Restor-A-Finish contains just the right amount of solvent blended with stain and mineral oil to penetrate the existing finish. This allows it to blend away scratches and other damage while restoring the color and luster in one simple step. As you read this, you may be asking, “How do I determine what color I need for this piece?” When using Restor-A-Finish, it’s best to use a color that matches your original finish. An exact match is not always necessary so if the piece you want to restore seems to be between colors, start with the lighter color. Restor-A-Finish is not designed to darken your piece in any way so when it is first applied, let it dry to really see the result that you are looking for. This goes hand in hand with testing the enhancer in a small, inconspicuous spot so you know what you are working with. Your final result will not leave a waxy feel on it similar to other products on the market. As a Precaution, protect your fabrics and carpets. If a spill does occur, scrub the area with soap and water or stain remover and wipe it dry. Before you begin, make sure that your project space is clear of any dust and you have wiped the wood furniture clean. It’s always best to begin testing this product in a small area that’s not noticeable first. Start by using a lint-free rag (or Fine Steel Wood) and laying over the opening of the Restor-A-Finish container. Close it tightly over top with your fingers as you tip the container on its side to allow the rag to soak up a good bit of the liquid. Your rag should NOT be dripping with the finish. But it should not be dry either. Avoid pouring Restor-A-Finish directly onto the piece to prevent using too much at one time. Cover a small area at a time and immediately wipe dry. As you start your process, take heed to the amount of enhancer that you are using. Too much in one spot is not the ideal way to go but neither is too little. If you have any severe scratches and/or white rings, use your Super Fine Steel Wool in place of the pad and apply Restor-A-Finish starting with minimal pressure. In this case, take more caution in your process so you don’t apply to much pressure to remove blemishes. After finishing up with the steel wool, wipe off any excess that may have accrued during the process. When using steel wool, you want to rub with the wood grain not against it. This allows the finish to mesh properly during the drying period. Some people confuse Restor-A-Finish with Danish Oil, tung oil or finishing oil. These oils usually soak in and solidify in the wood pores. What makes Restor-A-Finish so much better, is that as it soaks in, it takes the stain with it, restoring the finish to its original color and luster. We really love this wood finishing product and think it’s an absolute must for your collection, especially if you regularly restore wood furniture. Have it on hand to repair scratches, stains, or watermarks on any kind of wood pieces in your home in a flash! 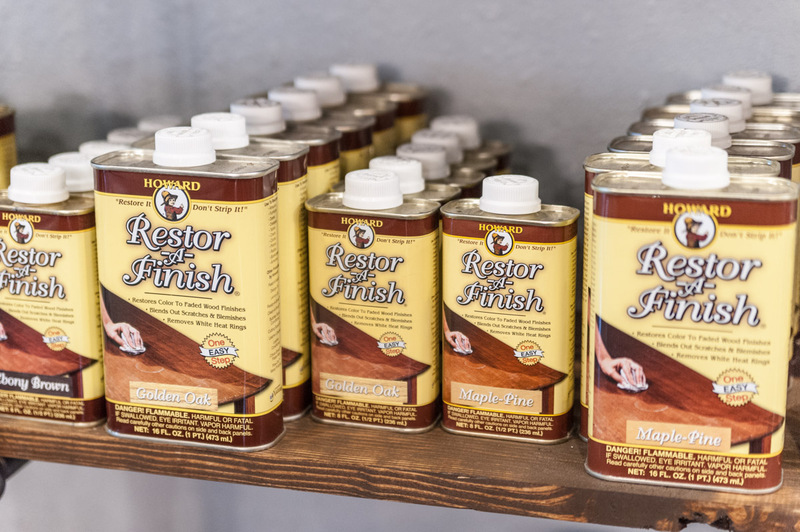 Have you used Restor-A-Finish to restore wood furniture in your home? Share your project images with us in the comments! Painting furniture has never been so much fun! Want to get the Featured Finds sent directly to your inbox? Subscribe today!